This is an exceptionally light sweet cream flavor. This decisive flavor can help improve the milky taste of other treats. Type: Sweet cream Water Soluble Flavoring. Ingredient: Natural Flavors, Propylene Glycol. Usage Rate: 15-20% for E-use. Flavor suitability: Desserts, cakes, pastries, ice creams smoothies, drinks, beverages, baked treats and more. Specific Gravity: 1.05 No Refunds on Flavoring. Lovely flavor for drinks and foods, maybe not so much for vaping. I'm at the last milliliter left of this lovely tasting flavor and I'm on the fence about buying more. I did make some great tasting vaping mixes with this flavor until I found the 3.588% Acetoin part. I wish I knew if any amount of Acetoin is ok to vape or should be avoided. Sweet Cream did make my black coffee taste as if there was really cream in it, though still black in colour. I have given up other flavors by different brands too, so it is not just Flavor West. This will be a hard flavor not to vape for me. Maybe just a small 8oz bottle more. 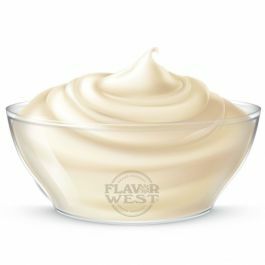 Sweet Cream is a must for softening desert flavors. Love this one, I prefer 2 - 5% to soften the "rough/sharp" tastes in some of my desert mixes, this is a must have. As a stand alone flavor though I would have to say no.